As you know the incidence of diabetes is growing out of control. One in three children born today will face it in their lifetime if current trends continue. One in four people who currently have it don't know about it yet. You may not know how diabetes can rip apart your vision in many different ways. It is the #1 cause of blindness in adults. You also may not know that as a California licensed optometrist I am responsible for diagnosing the health of your eyes. This means, as it relates to diabetes, that I am responsible for recognizing and diagnosing the effects of this disease on your visual system. Most have heard of "sugar cataracts." These are a complication of diabetes. The crystaline lens within the eye becomes hazy and results in blurred vision. I work with the best cataract surgeons to remove these opacities. 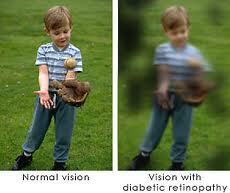 Diabetic retinopathy is another potential complication. This results in bleeding witthin the eye(s). Left alone it will cause loss of sight. Fortunately by teaming with retinal surgeons this complication can be reduced and/or eliminated with early detection. Inflammation of the cornea, ocular muscles and optic nerve are additional signs of diabetes. Early treatment can minimize these problems. Another diabetes complication is glaucoma. Blood leakage can occur within the eye forcing up eye pressure. This can also result in loss of vision. Bottom line - keep your blood sugars in the normal range (symptoms CAN be excessive thirst and urination). However studies indicate that blood sugar is difficult to sense. Have yearly physicals with bloodwork (diabetes is often combined with high cholesterol and high blood pressure). Be sure to have your eyes checked yearly - dilation of the pupils is important to detect subtle problems combined with photography of the tissues.